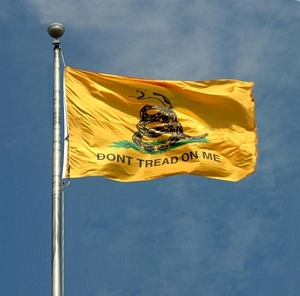 These are the finest "Don't Tread on Me" Flags made in the world. The nylon is supple and bright, the construction strong and made to fly outdoors 24/7. The 3' x 5' size will fly companion with any U.S. Flag 12' hoist high or smaller. I recommend about 5-feet of leader between your U.S. Flag and the Don't Tread on Me if your U.S. Flag is 8' hoist or higher. This will give some separation, and help the 3' x 5' Gadsden seem larger and prominent. If you don't see the size you want below, please contact me. I can have any Flag made. GEORGE@ApexFlags.com. These are great Flags of the highest quality. Fly it 24/7. This is a beautiful flag with a ton of history. 4-stitch seams, great rich color, and made of commercial grade nylon. If you're real observant, you'll notice that low quality Gadsden's Snakes are looking the wrong way. See how this Snake looks right. The Gadsden Flag finds its history in the U.S. Marine Corp and Benjamin Franklin. It was Ben Franklin who first depicted the United States as a Rattlesnake (rattlesnakes are only found on earth in N. America); and it was the Marines who first depicted a coiled rattlesnake on yellow drums to show American strength and the motto of "Don't Tread on Me!". Then Christopher Gadsden a Philadelphia Patriot presented the flag to Eske Hopkins the commander-in-chief of the Navy. And history was made. The Rattlesnake - "She never begins an attack, nor, when once engaged, ever surrenders: She is therefore an emblem of magnanimity and true courage. ... she never wounds 'till she has generously given notice, even to her enemy, and cautioned him against the danger of treading on her."